A particular model I call ‘traditional chaplaincy’ is deeply ingrained in the consciousness of the church. Such a deep and resistant image continues to dominate the church’s understanding of chaplaincy, influenced by the weight of history. ‘Traditional chaplains’ are agents of the church ministering to adherents who are geographically removed from parish life, and in particular, administering the sacraments to those who, through life’s circumstances, are displaced from their local church. Such chaplains have typically been ordained clergy who go about the business of parish life outside the parish – conducting worship, ministering the sacraments, educating, providing pastoral support and being the focus of the Christian community life of adherents distant from the parish. Traditionally, chaplains were appointed to institutions such as armies and prisons and hospitals. ‘Traditional chaplaincy’ has suited the purposes of the church over millennia – to ensure a presence in society’s major institutions, to do the church’s business there and to convey and strengthen the influence of the church. This is a model of chaplaincy that is about cultural transmission of parochial life. And it is probably the default understanding of chaplaincy among most church people. In our current context, such a model is of no import to the institution itself save what the institution or a smarter chaplain may make of it. Traditional chaplaincy is marginalized from the real life of the institution and the institution has no interest in supporting what churches may or may not do. There is a dis-connect between the churches and the institution. So today, chaplains who hope to survive the decline and irrelevance of the church are adapting to this marginalization. There is a movement by chaplains to provide pastoral care in a secular way. Institutions are rewarding this inclusive approach. Such chaplains have given up on the traditional model. They minister without condition (not just to their adherents) and they articulate their role in terms of the ‘spiritual’ rather than the religious. The ‘spiritual’ has become the purvue of the chaplain, while the parish minister is inevitably dispensing ‘religion’ – that is, upholding those practices important to the culture of the church. The parish minister is protected from the disconnect between the church and the world because the focus of the church and the seat of power of the church is founded in the parochial – the effort to continue parish life. The theological insights of the Dutch Catholic theologian Erik Borgman shine a light on our modern dilemma – the irrelevance of the church and its message, from the perspective of the world. Borgman suggests that the typical consciousness of the church assumes that the world is god-less and in need of salvation. The world is the domain of sin. 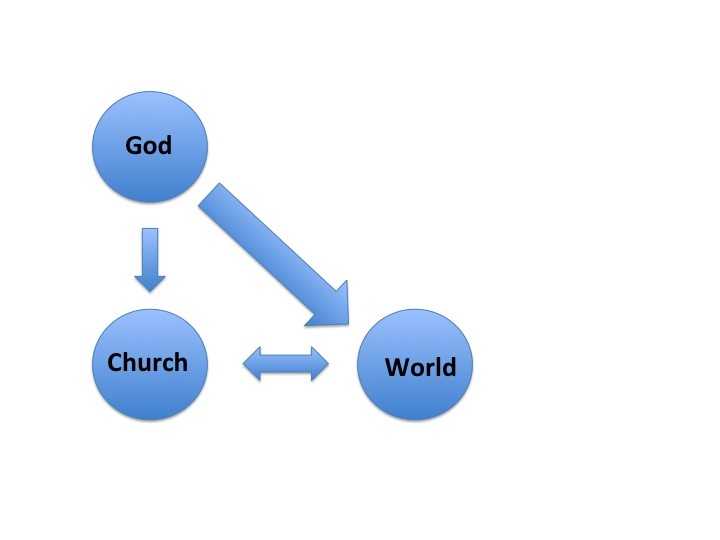 The church mediates the means of salvation between God and the world. God has revealed the means of salvation to the church. Chaplains within this paradigm are the church’s representatives bringing the good news of salvation to ‘unsaved’ people in the world, or pastoring the church’s adherents in the world. The church is discovering that the world is not interested in the church’s ‘answers’ and finds such a paternalistic approach offensive. The church, if it is listening at all to feedback from the ‘World’, is being given the message that the World’s people (at least in the West) are “spiritual, but not religious”. Commitment to institutional religion has declined dramatically and continues to do so – which may be an indicator that the traditional approach, based on the assumptions underlying figure 1. is failing in the very mission it has assumed for itself. Many churches are responding to this failure by ‘trying harder’. Theologically, it is the task of churches to respond to Gods salvific presence in the midst of our confusing world, not to preach their own presence as salvation from the confusing world. The pastoral task to be and stay close to people in their experiences, is based on the firm belief that it is there that God is kenotically present, as the Biblical traditions teach. Borgman is not suggesting the traditional approach ‘in situ’ – that is a Figure 1 approach that embeds itself in the world, like a journalist in a combat unit. The Church should not be seen as the community of those firmly convinced of the truth of their tradition, but as the community of people seeking the support of the Christian tradition to discover Gods salvific presence in the world, and to walk — and to help others to walk – the path to true life God’s presence opens. At the heart of this God-in-the-world consciousness is the conviction that God is present and active in the world. The chaplain is therefore looking for the activity of God in the world, to cooperate and support that activity, not seeing herself as an agent of the church mediating God to the world (nor a mere agent of the institution). This, incidentally, is perhaps why many effective chaplains, effective from the point of view of the institutions in which they work, often find participation in traditional church life so problematic and say they “don’t feel at home” there – if they attend church at all! They feel at home in the world, where they find God, and are uncomfortable in church culture. the churches defunding chaplaincy because it cannot see how chaplaincy is delivering the goods according to the assumptions of figure 1. Institutions embracing a secular chaplaincy model that is inclusive and articulated in terms of spirituality. A refusal by chaplains to engage in conscious attempts at evangelization. It may be that chaplains become prophets to the church, agents in the church’s own reformation, by helping the church examine how it has arrived at such a position of impotence. 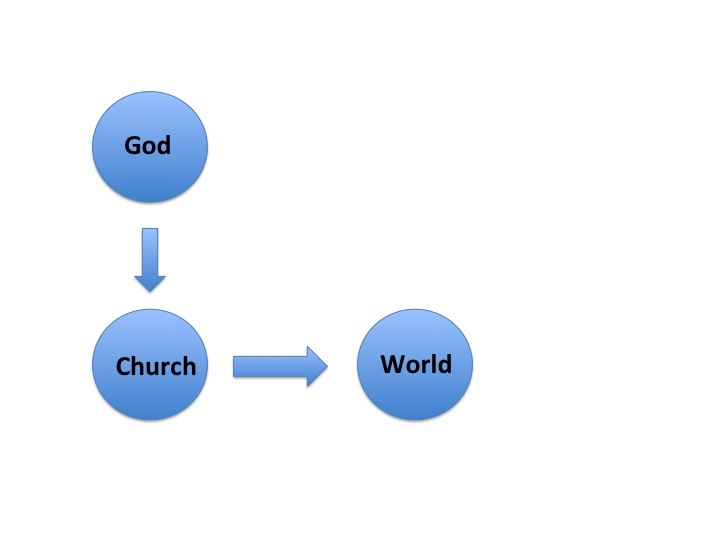 In my view, the church should reject the assumptions of Figure 1 and its concomitant outmoded structures. It may then be in a better position to interrogate any addiction to a self-interested exercise of power and any propensity for denial in the hope of protecting itself. And may position itself for creative support of what God is doing in the world. This entry was posted in Uncategorized on July 29, 2013 by Geoff Boyce.